Being inside Richmond Hill’s newest and arguably most laid-back eatery is a little like floating on a tiny private island – complete with breezy ocean hues, palm trees, pretty girls, sand to dip your toes into and, of course, heaps of seafood to indulge in. It’s rustic, rough and ready, and not anywhere near the beach. But step inside and you may just believe you’re on a jolly seaside holiday. For my husband, Salvelio, and I, a recent visit to Beach House at 70 Campbell Street brought back memories of a Spanish summer in Cadiz – when we’d park off at the tacky beach chiringuitos (bars) for a fishy fry-up and way too much tinto de verano (sangria-type drink). 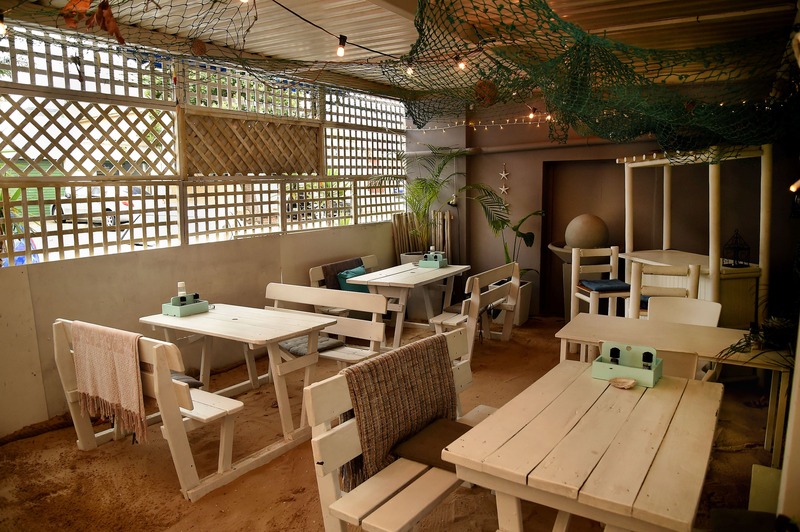 Beach House is the brainchild of the Van Wyk family: mom, Linda, who also owns the Up-The-Deck restaurant in the harbour; dad, Kobus, who’s been in the fishing industry for 30 years; and winsome daughters, Dominique Burger and Gabriella van Wyk, who assist in running the establishment. 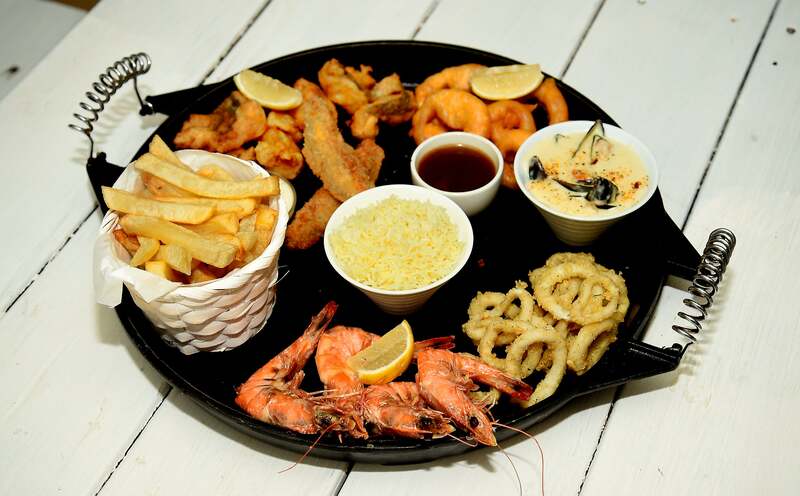 The menu is all about seafood, though there are a few meaty mains on offer. However, I say forget the meat and go hell for leather for the fish: that is what this family know and do best. We ordered the seafood platter for two with a side order of spicy squid wings, just for the novelty factor. The wings were deliciously crispy and a clever way to use every part of the mollusc. I remember my late father, a real salty dog, doing the same and again that took me back to a happy place. The platter was laden with beautifully fresh, deep-fried hake, local calamari (which has much more flavour and texture than the imported stuff), prawns, mussels, tempura-battered lobster meat, along with chips, rice, onion rings and two different sauces. Considering the volume and quality of food, the platter, at R250, was exceptional value for money. We piled into it with so much gusto that Salvelio lost his cutlery under the table. Who cares; that’s what fingers are for! We probably ate way too much, too, but sometimes part of the fun is being able to fully immerse yourself in a dining experience. A couple of glasses of Vondeling Merlot Rosé proved the perfect accompaniment for all that fishy goodness. 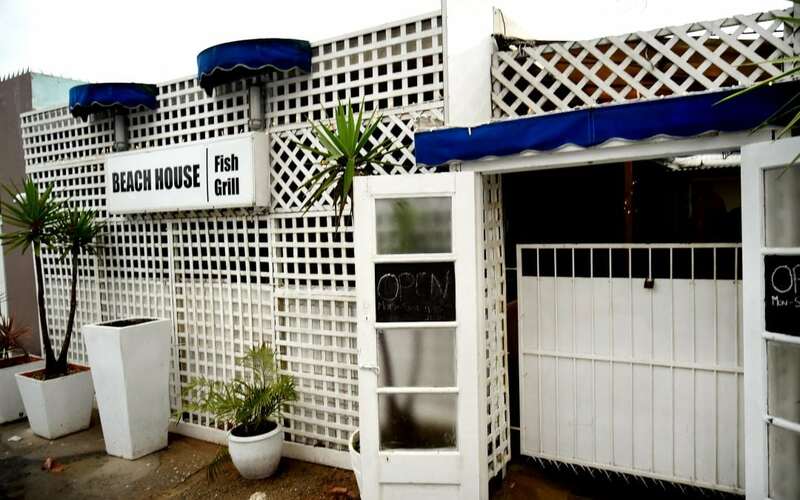 Beach House Fish Grill is open for lunch and dinner, Monday to Saturday. Bookings are recommended on Fridays and weekends. To see more of what PE has to offer, view the neighbourhood on Private Property.